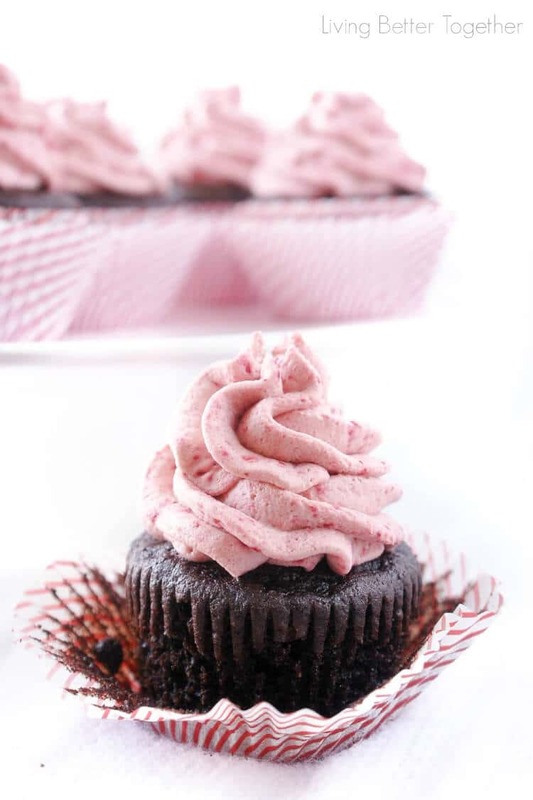 These dark chocolate cupcakes are topped with a whipped raspberry vanilla creme frosting that’s out of this world! Well guys, this is it, this is cupcake perfection. It’s okay, take a minute to take it in. The flavor and texture are so perfect it’s hard not to sigh in awe of all this cupcake’s glory! Moist dark chocolate cake loaded with mini chocolate chips and topped with a light and fluffy Raspberry Vanilla Creme Frosting. These cupcakes are to die for, absolutely delicious! The frosting is the best part, it’s light, fluffy, and creamy and will definitely be my new go to. The Raspberry Vanilla Creme Frosting tastes like a Raspberry Cream Saver. Yes, you read that right, a Raspberry Cream Saver, it’s phenomenal. I love that there are so many flavor possibilities with the frosting and can’t wait to start baking up some more cupcakes to use it on! The chocolate cake is my good ole stand by; it never fails, never disappoints, and never gets old. 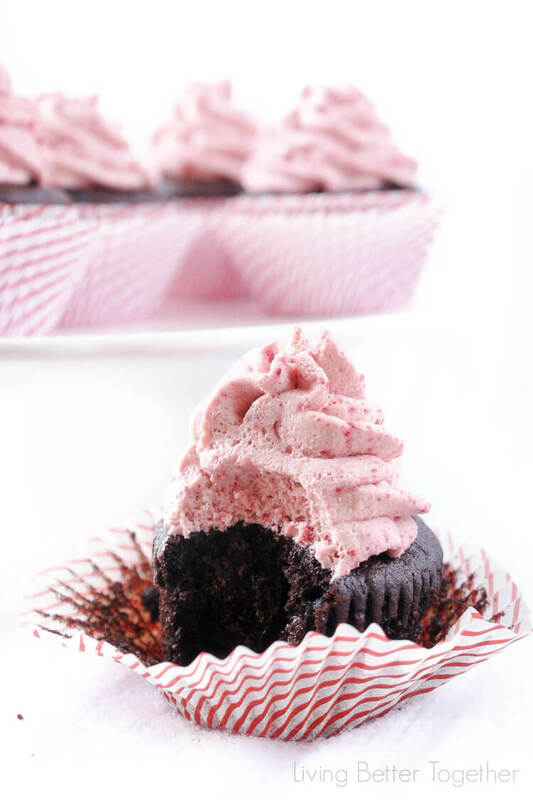 These dark chocolate cupcakes are topped with a whipped raspberry vanilla creme frosting that's out of this world! Fill cupcake liners 1/2 - 3/4 full. Remove from oven and transfer cupcakes to cooling racks to finish cooling. Add freeze dried raspberries to a food processor and blend until you have a fine dust. Combine all ingredients in a stand mixer or large bowl and whip until frosting is light and fluffy. 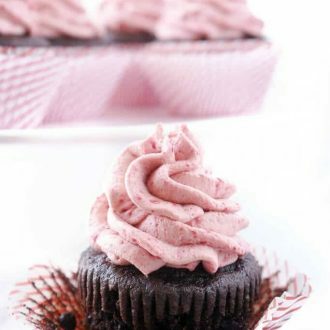 Use a bag or decorator tool to pipe frosting on cooled cupcakes. Serve immediately for best taste. Frosting adapted from A Farmgirl's Dabbles. So I’ve kind of been on a little cupcake binge, not in the sense that I eat five a day; more that when I want something sweet, I want a cupcake. They truly are the perfect treat, the perfect ratio of frosting to cake, the perfect way to indulge but not over do it. They’re easy to serve, easy to transport, easy to eat. What more could you want from a dessert? It’s so versatile. So many possibilities when it comes to flavor, texture, design. Whenever I make them, it’s almost therapeutic. I have a recipe base that never fails and I just build from that each and every time. I can always count on my cupcakes to turn out great and be a hit at home, the office, or a family event. Some might say that the cupcake fad is over, but personally, I think it’s here to stay. At least in my house anyway! Weird that it’s showing you a square, it’s 1/3 cup. The frosting recipe does not work. I’ve combined all the ingredients and it looks like raspberry milk, it’s not thick at all. I feel like I wasted a lot of time and money on this project. Hi Cecilia, It sounds like it just hasn’t been whipped enough. Did you make sure to use a heavy whipping cream? It takes a few minutes (a little longer if you’re using a hand mixer) but it should whip up just like whipping cream but a little more stabilized because of the pudding mix. It’s freeze dried raspberries, so make sure that’s what you use! Enjoy! I’m just wondering, how well does the frosting set? I am going to make these cupcakes and then travel with them about 1.5 hours and I’m wondering if the frosting will set well. It’s a whipped cream based frosting, so it’s not going to crisp up like a buttercream. You want to keep it out of heat as much as possible so it doesn’t break. I’ve transported this frosting several times for about 40 minutes, but I can’t speak to the longer duration in the car. What is ‘freeze dried’ raspberry, where do I find them? What is vanilla pudding ‘powder’? Is that vanilla pudding? You can buy freeze dried fruit at Target, Trader Joe’s, Whole Foods, and other, I’m sure. Yes, it’s vanilla pudding, but just the powder, you do not make the pudding according to the package instructions before adding to the recipe. 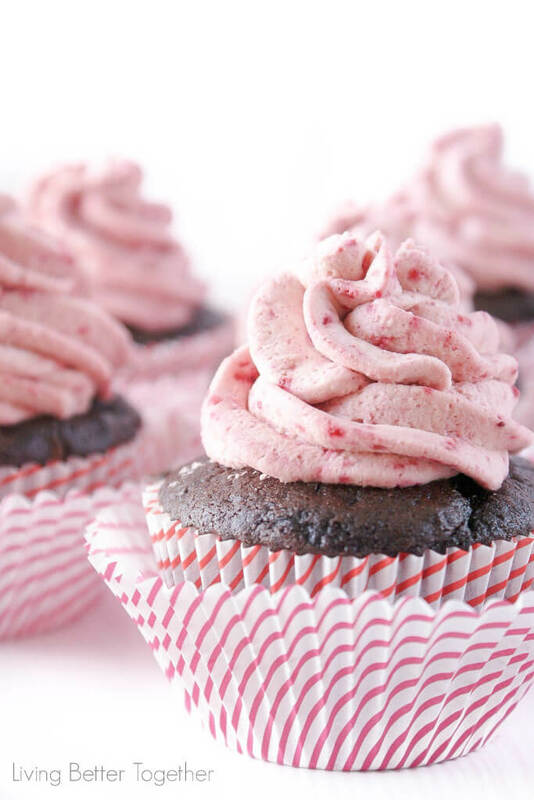 The raspberry frosting is amazing! I used it with my own chocolate cupcake recipe and I love the way it turned out. The cream whips up faster with the pudding mix used as a stabilizer. It’s light and sweet with the right amount of tart – definitely making this again.